Pearl white handmade card 127 x 178mm with image of stylish lady in red dress and hat in a cafe, mounted onto black and silver polka dot background matted onto red mirror card. 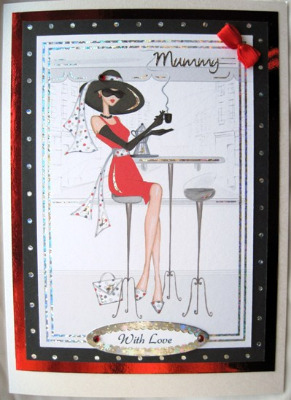 The words 'With Love' are highlighted with red gems and there is a silver crystal gem on her handbag. The printed paper insert reads 'Wishing you a very Happy Birthday'.